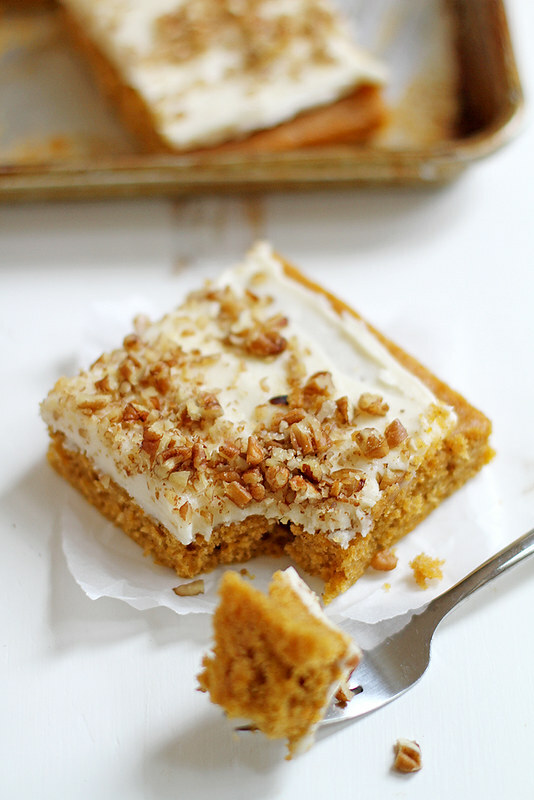 Be still my pumpkin and bourbon and cake-loving heart. This sheet cake, you guys. Can I tell you something about it? It’s pretty tasty. And I think you should make it for your Halloween-ing weekend. I actually made this cake a few weeks ago for my friend Lauren of Keep It Sweet Desserts, who just had an adorable baby boy named Liam whose cheeks I want to squish through the computer screen. Sadly, I couldn’t literally share this cake with her as we live a few hundred miles from each other (which is so unfortunate, considering all of the dessert yums that girl makes that I would happily take from her if we were neighbors). Instead, I gave it to my husband to share with his co-workers and apparently they loved it, said the three crumbs that came home with him later that day. Anywho, about that baby. So Lauren can get in as many sweet snuggles with him as she can, I’m guest posting for her today with — you guessed it — this cake. So my suggestion? Drop everything and head over to her blog for the recipe. Need I remind you of the bourbon? Happy (cake-eating, Halloween-ing) weekend, friends! Oh my! This looks amazing but sounds out-of-this-world delicious! WANT!! I only have one problem with this. I don’t want to make it for my Halloween-ing weekend. Because that is a WHOLE DAY AWAY. I want it for breakfast. Like the meal that I am going to eat in about an hour. That one. RIGHT NOW. I adore the addition of butternut to this! Bourbon-vanilla frosting?! I want it all!! This sheet cake looks like it’s absolutely possible to resist. I want to eat it with/in my morning coffee! Butternut and pumpkin?!?! Girl, you know my weakness. I love this recipe. Bourbon vanilla cream cheese frosting?! Love! oh man, that bourbon vanilla frosting is calling my name! this looks awesome! Holy cow. This looks unbelievably insane. I would like to dive face first into this recipe!!! Perfect for fall and being festive. DEFINITELY trying this one out. NEED this recipe!! It’s so beautiful with such amazing flavors. That bourbon vanilla cream cheese frosting sounds incredible. Pinned! This sheet cake looks amazing! I love all the different flavours you have in it! Oh my, I love the flavor combo on this cake! YUM. Oh wow this looks amazing!! I love the spice and the warmth of the flavour! ps. Happy halloween! Stunning dessert! 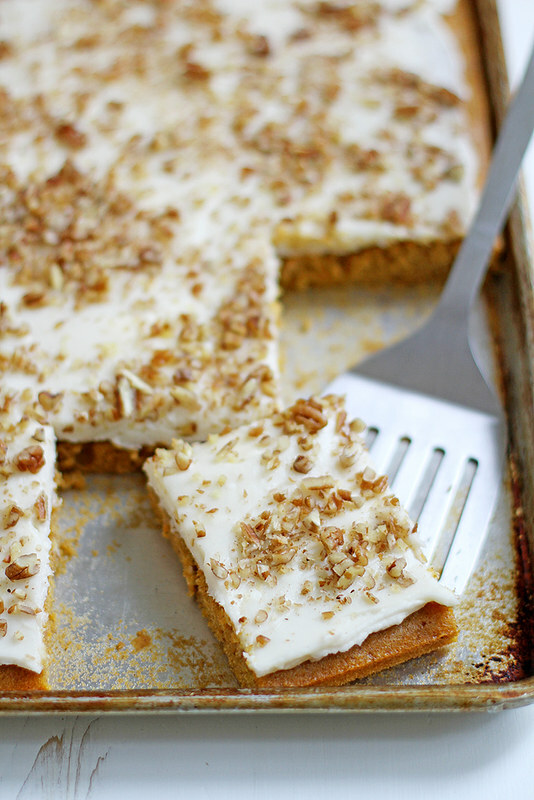 You simply can’t go wrong with pumpkin cake. Love the twist on the frosting. Mmm…. This is the perfect cake for Halloween weekend. Mmm, bourbon! OH MY GOODNESS! Those photos – too gorgeous! And I love the butternut addition, too – it’s such an undervalued squash! Looks incredible! Ahhh bourbon….Heading over to check out the recipe! Thank you so much, Steph! I would have loved to sit and share this cake with you… one day (maybe with our little ones)! This looks amazing! I just made a bourbon cream cheese frosting. I can’t wait to go check this out! I might be sweating it out in Australia, but for this pumpkin cake I would delightfully turn on the oven for a piece! Perfect! I LOVE sheet cake. Totally actioning this over T-Giving! What a great cake to share with friends!